Taking a class on how to release stress and anxiety introduced me to a whole new use for the humble tennis ball. I have spent a fortune on gadgets for trying to rid my life of stress. My life is truly a gift, but I am balancing a job, a small business, and a family. Things get complicated. I’m looking for a way to take care of myself mentally and physically. To deal with anxiety and the feeling of being overwhelmed, I sought all kinds of solutions. Bought nearly a dozen yoga mats. Inhaled untold numbers of essential oils with names like “Refresh,” “Breathe,” “Mindful.” Took classes to Learn how to belly breathe so I could calm my nervous system. Read book after book on how to find my path to peace. This mad search for peace just created more stress, as I spent my time and money on stuff that just didn’t work. I was getting desperate. Then, my solution magically appeared. My yoga teacher asked me to attend a new workshop she was hosting. It was with a massage expert who would explain the value of “roll and release” self-care with foam rollers. She told me attendance was low and she was worried she would have to cancel the workshop. I agreed to help her out and go. Turns out this favor for someone else was actually a stress-relieving game-changer for me. The class began with the teacher showing us how to use large foam rollers to relieve tension across various parts of our bodies. I had never used a foam roller, and while it was nice, I wasn’t feeling the urge to run out and buy one right after class. Then, the teacher brought out a bag full of tennis balls. I thought that was odd. He had each of us take a ball and then lay on our backs on our yoga mats and begin to take deep breaths. With our eyes closed, he told us to scan our body to find the points where we felt tense or tight. For me, it was my upper right shoulder which is always slightly painful because of all the typing I do as a writer. Once we had all located our point of pressure and pain, he had us put the tennis ball right at that spot. For me, that mean putting the tennis ball near my right shoulder blade as I laid on my back. Then he told us to move around a bit with the ball until we found the point where the pressure was the most intense. When that point was found, we settled in and let the tennis ball do the work of breaking up the tension. In short, it was an amazing release I had never felt before. This really tender, painful part of my body was surrendering to the pressure of the tennis ball. I felt so much better. The teacher explained that what we were doing was myofascial release. The fascia or connective tissue in our bodies becomes congested from all forms of stress, creating tension points in our body. 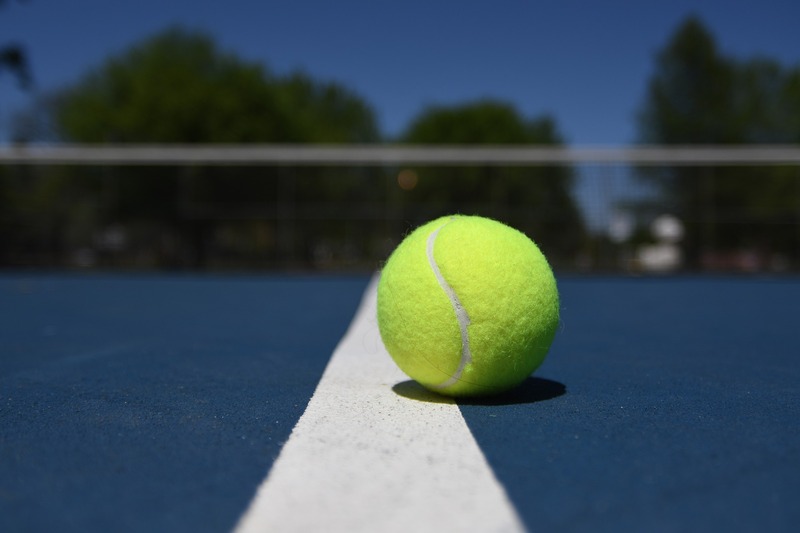 The tennis ball has the ability to pinpoint the exact spot of pain, and when gentle pressure is applied by either laying down or leaning up against a wall, the tennis ball can get into the congestion and break it up, providing much needed relief. Now I can’t live without my tennis ball. Since discovering this stress hack, I keep tennis balls everywhere. I always have one in my bag, one in my desk at work, one in my car, and several all over the house. I always take one on trips to help unwind. I’m a little obsessed with my tennis ball trick. I feel sometimes like Tom Hanks in Castaway when he starts talking to his ball Wilson. In similar fashion, I have named my tennis ball Venus Serena in honor of those two empowering icons, and because relieving stress when I need it gives me a sense of empowerment. In tennis terms, my stress is now at zero or “love.” As in love my tennis ball hack.